Player of the Game: Trey Burke scored a career-high 30 points go along with 8 assists and 7 rebounds in 40 minutes of play. He shot an impressive 12-20 from the field, 2-2 from the FT line and 4-8 from behind the arc while only turning the basketball over twice. The Jazz were +21 in Burke’s 40:28 minutes and -17 in the 7:32 he was on the bench. 6:46 1st-Qtr – Left-wing catch&shoot transition three. 5:09 1st-Qtr – Pull-up 18-foot banker from off high screen-roll with Favors. 0:03 1st-Qtr – Pull-up 17-footer on high screen-roll with Kanter. 3:58 2nd-Qtr – Left-corner catch&shoot three off ball rotation. 3:29 2nd-Qtr – Uncontested run-out layup (from Hayward). 2:19 2nd-Qtr – Transition catch&shoot right-wing three (from Hayward). 10:07 3rd-Qtr – Top-of-the-circle catch&shoot three (from Hayward). 8:16 3rd-Qtr – 20-footer off side pick&roll with Favors. 1:53 3rd-Qtr – 14-foot floater off glass on high screen-roll with Favors. 0:01 3rd-Qtr – 2-on-1 fastbreak that Burke kept himself by faking a behind-the-back pass then converting a hanging up&under reverse layup maneuvering around E-Twaun Moore. The proper play was to pass the ball to Burks on the left-wing for a layup but Burke finished with spectacular ball-fake/layup so I could only stay mad at him for about 5-tenths of a second. 6:34 4th-Qtr – Side pick&roll with Favors (screening baseline) for 15-foot floater. 3:45 4th-Qtr – Pump-fake dribble-in 16-footer from Hayward running a side pick&roll. As you can see of Burke’s 12 baskets – 5 came via pick&roll, 4 came in transition and 3 came playing off-the-ball. The Magic defend screen-roll as I’ve diagrammed in great detail here, by going over on the screen and dropping the big back into the lane – where you’re funneling the ball-handler and/or screener into taking the mid-range jumper. 11:47 1st-Qtr – Hayward 22-foot pindown jumper. 10:48 1st-Qtr – Ball-rotation and swing pass to Jefferson for right-corner 3. 6:18 1st-Qtr – Transition pass ahead to Hayward for catch&shoot 18-footer. 0:53 1st-Qtr – Side pick&pop to Jeremy Evans for 18-foot baseline jumper. 5:26 3rd-Qtr – One-hand off-the-bounce bullet pass to Marvin for layup. 1:23 3rd-Qtr – Fastbreak pass to Hayward for layup. 7:45 4th-Qtr – Hayward 16-foot baseline jumper. 1:14 4th-Qtr – Hayward right-wing 19-footer off curl/pindown. Of Burke’s 8 assists, 3 came in transition (in a low-scoring game the Jazz finished with 17 fastbreak points) and 5 of the 8 went to Gordon Hayward. Also only one of Burke’s assists came via the pick&roll although 5 of his baskets did – which again reflects what an Indiana/Portland-style screen-roll (which Corbin has finally begun consistently using) tries to do – which is take away the screener rolling to the basket and take away deep penetration that leads to direct layups or drive&kick threes. Favors had a couple pick&pop jumpers he missed and Evans made the one, but the Magic wanted to force Trey Burke to beat them with his mid-range game and last night Burke made them pay. The Jazz were able to create open looks thanks to Gordon Hayward’s hard and smart utilization of off-ball screens. 1. 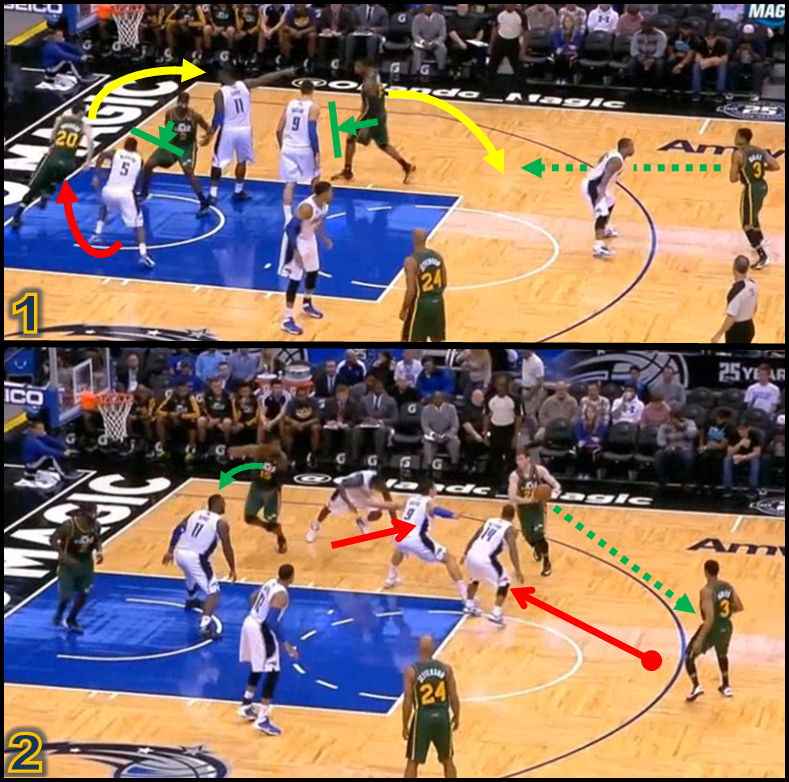 Here the Jazz run a little stagger-screen action for Hayward. Hayward’s man (#5 Victor Oladipo) trails, giving Hayward the green-light to curl the entire way around. 2. Hayward curls hard off the screens with Oladipo still trailing from behind – which forces Orlando to sag down to cut off his driving lane. The result is a simple kickout back to Burke at the top of the key for a three which he made (or a swingpass to the weakside if RJ’s man rotates). If they don’t drop down from the top but the big still shows out (like #9 Nikola Vucevic does) then Hayward can look for the big diving to the rim. Smart basketball is about reading and reacting and when the Magic tried to defend this set differently – Hayward still made them pay. 1. Here Hayward’s man (#22 Tobias Harris) tries to shoot the gap. 2. Hayward reads this and rather continue his curl – the on-sight adjustment is to fade. Harris is caught going under and Hayward drains the 18-foot jumper to put Utah up 4 ultimately seal the win. These are the types of mid-range shots you don’t mind because they’re wide-open, in rhythm, and give the offense a positional advantage while putting pressure on the defense. 1. 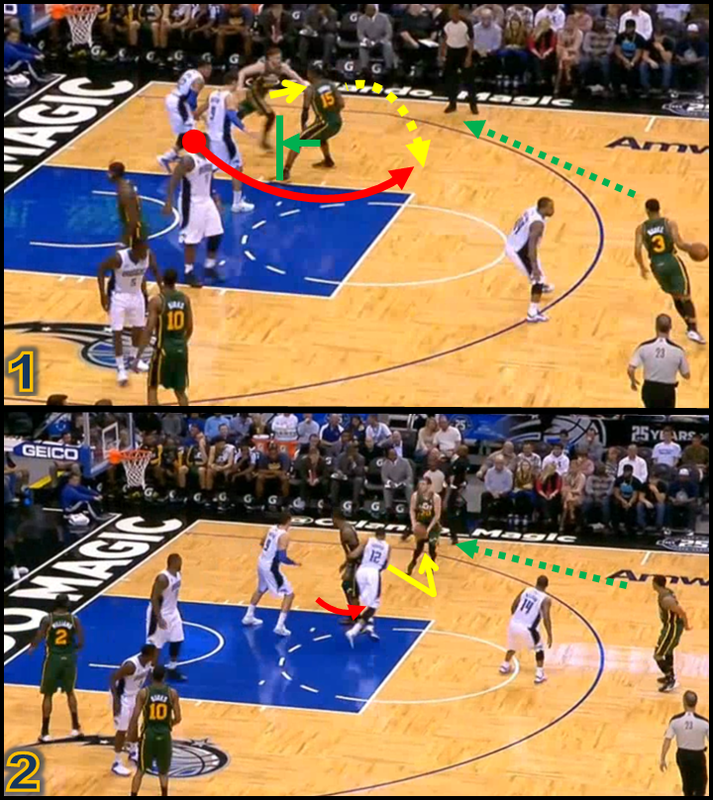 Trey Burke’s pick&roll mid-range scores (watch how Orlando’s bigs dare him to shoot). 2. Hayward’s hard/smart movement utilizing off-ball screens (watch how the curl sets up scenarios where a simple kickout pass leads to a three/ball-rotation). Trey Burke recorded the first 30-point game by a Jazz point guard since Deron Williams scored 39 points against the Spurs on January 26, 2011. Utah’s 86 points are the fewest they’ve scored in a win since February 1, 2013 in an 86-77 victory over Portland. Utah’s lineup of Trey Burke, Alec Burks, Gordon Hayward, Derrick Favors and Enes Kanter played 4:30 together and were +5 over Orlando during that time. During last night’s game Peter Novak began tweeting out classic lovesong lyrics with Trey Burke’s name in them. (Sidenote: Peter’s is one of my favorite twitter follows, follow him for a nice dose of Jazz-related intelligent humor, snark, sarcasm, common-sense, and salary cap expertise). In the spirit of Jazz lyrics, I thought I’d share my own – set to Forever Young by Rod Stewart. The official music video is a bit dull, but in the Jazz re-make I see Jeff Hornacek singing this to Alec as they both ride in the back of the pickup immediately after he accepted the Phoenix Suns’ head coaching position, with Boler, Harpring, and Sidney Lowe making cameos in the motorcycle gang. In his first 15 games Trey Burke had alot of great plays and multiple very good games – but last night it all came together as he turned in one of the best performances not only for the Jazz but in all of the NBA. Coming into the game he was shooting just 39% on two-point FG’s but he made 8-12 last night, to go along with 4-8 from behind the arc. He showcased his complete offensive repertoire, his passing ability, a beyond-his-years understanding of the pick&roll and he again took care of the basketball (only 2 turnovers and averaging just 1.4 for the season). Burke is receiving major playing time as a rookie and he has made the most of it, continuing to develop and improve right before our eyes. 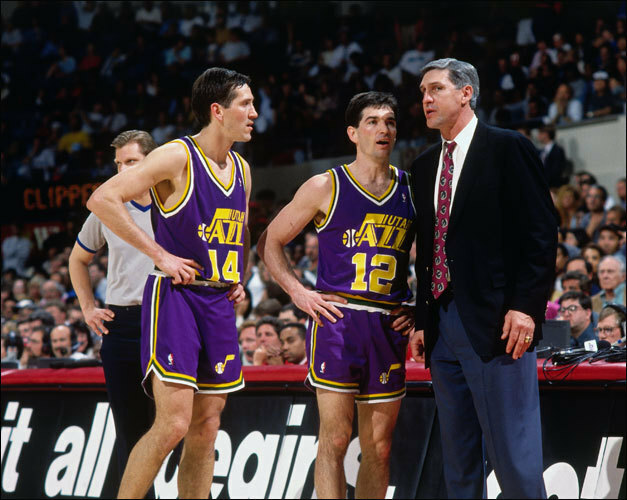 I don’t think anyone is still recommending that Burke shouldn’t start simply because John Stockton didn’t start immediately nearly 30 years ago. 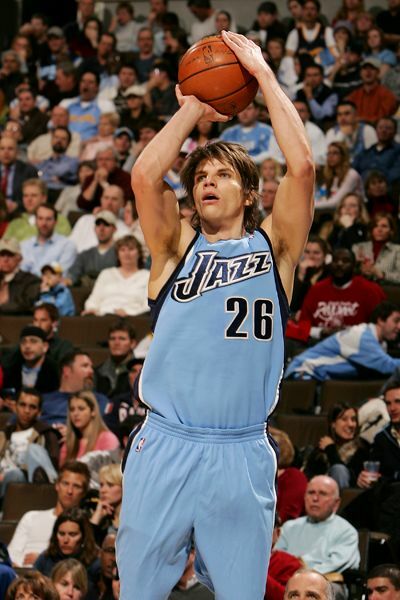 It’s also important to understand that the Jazz are still a team with a 7-21 record. If you claim the Jazz’s 1-14 start is irrelevant because of their early-season injuries, then you also have to say 4 of Utah’s 7 wins that came against opponents missing key players – Chicago (without Derrick Rose), Houston (without Chandler Parsons), Sacramento (without Rudy Gay) and now Orlando (without Aaron Affalo) – also deserve an asterisk. With Burke back the Jazz are clearly playing better offensively (although even with Burke’s brilliance they struggled with a 37-point 2nd-half), played well defensively last night – and have started to resemble the fun, exciting and competitive team most hoped they would be entering the season. That doesn’t erase the trainwreck start Utah had to the season, but that reprieve seems to be a growing sentiment from those inside the organization that is reflective of the past several Jazz seasons. The problem is once you start making excuses – you lower the surrounding expectations, accountability and standards. I feel fortunate the Jazz have a high-profile rookie like Trey Burke who not only has the talent and confidence in his ability – but most importantly is someone who’s been a winner on every level and is used to being on the right side of the scoreboard. I don’t expect the Jazz to win 3 out of 5 for the remainder of the season, but with Burke leading the way I do feel confident losing won’t be something the players will come to accept or excuse. Jazz fans have big goals in mind for this team down the road, but most importantly – so does Trey Burke. Foundation: The SEER Group has built over 100 wheelchair accessibility ramps in Utah free of charge. Played every single game in 17 of his 19 NBA seasons. "All you can do is prepare your best and lay it all out there." "We can't put a diaper on him one day, and a jockstrap on him the next." "If you get [in] an ice pick fight out in the parking lot, then you have to try to solve that problem." "You know, you can't jackpot around and get better." "I was glad DeShawn tried to knock [Ricky Davis] down. They can put me in jail or whatever they want for saying that but that's the way it is." "...losing a player - you can sit around and feel sorry for yourself, or you can go play the game and try to get somebody else ready to play." "As long as it's (confrontation) long-distance it's not a problem. That's usually what I deal with - guys long-distance, whenever they get up closer I don't have a problem with it." "I'll fight you all night long, but I won't turn my back. I'll look you right in the face and take it right down the pipe and that's what I expect my players to do." "A gentle push, a mild arc - the ole cowhide globe hits home!" "Stockton-to-Malone at their ever-lovin best!" "Good if it goes it's gone! Count it and the foul!" "Stock yo-yo's from the angle left..."
"You gotta love it, baby!" "From the time Derek was here (Nov 29th, 2012) to his signing with OKC (Feb 26, 2013), his kids are older, they can deal with things better. So I understand him having more comfort in being away from them." "Usually when you help somebody, you expect some semblance of loyalty back. So when you don't get it, it's more disappointing."